Currently browsing posts filed under "William Lowndes Yancey ‘1833"
David Kane ’58 noted this book review in the Wall Street Journal. [L]ater, a Confederate diplomat and senator, he articulated the Southern cause with a startling force and clarity. Now the subject and his biographer have met. Eric H. Walther’s authoritative “William Lowndes Yancey and the Coming of the Civil War” is the first biography of the great orator and “prince of fire-eaters” (as a Cincinnati Commercial newspaper reporter once called him) since 1892, and it is long overdue. As Mr. Walther’s title implies, Yancey (1814-63) helped spur the move to war. He and his political kin tried mightily to push, pull, cajole and coerce a majority of their fellow white Southerners into secession. It took 30 years, but they did it, and what listeners described as Yancey’s “sweet” and “musical” voice was one of the secessionists’ greatest tools. 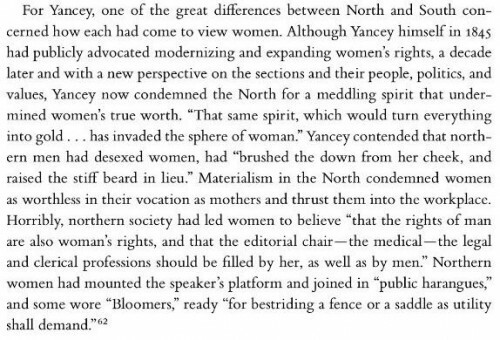 One auditor said of Yancey’s speeches that they were “seasoned with the salt of argument, the vinegar of sarcasm, the pepper of wit, and the genuine champagne of eloquence.” A reporter claimed that Yancey could have led a New Orleans audience into the Mississippi River. 1) Unfortunately, neither Amazon nor the publisher’s homepage allow for on-line searches. Does anyone know if Yancey’s time at Williams is described in any detail? He was apparently a member of the class of 1833, but only stayed at Williams one year and never graduated. As noted by Scott McLemee, academic publishers should be doing a better job of reaching out more broadly to potential readers. If there were a lot of material on Williams in this book, I (and other EphBlog readers) might buy a copy. 2) There is a great senior thesis to be written about Yancey’s youth in Troy and his time at Williams. Who will write it? As Richard Dunn explained, the best senior theses are written about discrete, contained topics that other people haven’t written about time and again. All else equal, a history thesis about a small but interesting aspect of Williams will be much better than one about the causes of World War I. 3) And, on a personal note, today is David Kane’s ’58 birthday. Happy Birthday Dad! EphBlog is powered by WordPress and delivered to you in 0.873 seconds using 29 queries..